Here we were, on pilgrimage in India. Of course I could not help but have at least some kind of agenda, a basic roadmap that I was attempting to follow out. What I didn't fully understand yet was that this was India, where schedules of any kind are very flexible. I am reminded of one story I heard of an American ranting at an Indian railway station because the train he was waiting for was over an hour late, when a Brahmin standing next to him leaned over and gently told him in perfect English that this was yesterday's train that had not yet arrived, over 24-hours late. Why I tell this is because the Royal Nepalese Airlines had flown us in the opposite direction to where we wished, dropped us in a jungle, and we had lost an entire day, plus another day to set it right. The upshot of this fiasco was that the folks who were expecting us to arrive at the village of Mirik in West Bengal were worried because we never showed up. And the worry was acerbated by the fact that they knew we had to drive through the very dangerous road from the Indian border town of Karkavavitta, a place where you drive at full speed, without daring to slow down even for stop signs, because bandits routinely overrun cars, robbing passengers, and occasionally killing one or two in the process. Of course folks who knew we were in route were worried, and we had no way to reach them. Cell phones were not common, especially in India, in the mid-1990s. We didn't have one with us. Our good friend Ngodup Burkhar was waiting for us at the Bokar Ngedon Chokhor Ling Monastry in the village of Mirik in the hills not far from Darjeeling, the area where the 11th century Mahasiddha Maitripa, one of Marpa the Translator's gurus, had done retreat. Ngodup Burkhar, who had translated and attended to our teacher Ven. Khenpo Karthar Rinpoche for over twelve years, was now translating for the Ven. Kyabje Bokar Rinpoche, who is considered the spiritual heir (heart-son) to the great yogi Kalu Rinpoche, holder of the Shangpa Kagyu Lineage. Bokar Rinpoche is considered one of the main meditation masters in the Karma Kagyu lineage. This is a continuation of our story when the Nepalese National Airlines dropped us off in a cow pasture by mistake at the wrong end of Nepal, and left us there. It took us two days to get back to Kathmandu and on track. This time the tiny plane did seem headed in the right direction and we watched the mountains of Nepal align themselves to our left and the wide low plain of India open out on our right. After about an hour we landed in another grassy field at another miniscule airport, one complete with cattle on the runway: my wife, my son, myself, and our pile of gear. Our two daughters had decided to stay in Kathmandu and hang out while we pushed on to India. Some friends were watching over them. Once again I set out to find a taxi to take us to the border and hopefully beyond. As it turned out, there really was only one taxi there, so there was not a lot of choice, a sturdy jeep-like Toyota Land Cruiser. And, in what turned out to be one of our luckier moments, the driver would not only take us to the border, but could drive us all the way to the village of Mirik, high in the mountains of West Bengal. That was the good news. The bad news was that he did not speak any English, but what the hell, we had no choice. The important thing is that we had been repeatedly warned that the area in India just beyond the border town of Karkavitta was very dangerous and had to be negotiated with care. The best was to drive right through at high speeds without stopping no matter what happened. We were told that cars had recently been stopped and, in the past, people even killed in that area. We could only hope that our new driver was not in cahoots with any bad persons ready to turn us tourist-westerners over to a band of thieves. Such were the thoughts of this crazy American. To aid to my paranoia, as we set off to the border, another man jumped into our open jeep, uninvited. This kind of thing is common in Nepal and India, where everyone wants to get on board any moving vehicle and hitch a ride. Even so, I was visibly alarmed. Our driver calmed us, explaining that this was his friend and he was only going to the border. And this new person spoke some English and explained that he was a travel agent. He proceeded to further scare us "pretty good" about the dangers of the border town of Karkavitta and the area just beyond the custom checkpoints. We already knew. And so we drove toward the border on what was called by our driver's friend a "national highway" (a road that was about as wide as your average driveway). We were stopped every so often by groups of men who demanded one or another kind of road tax. They would lower huge poles to block the road and a large group of men would demand money. One of the supposed causes was some religious celebration that they were preparing for which they required donations. Our driver handled this in one way or another, often promising to pay on the way back (which in fact was a week away). Or, claiming he had no small bills, he would catch them on the way back. Still, all of this was worrisome to us. After a while we reached the rugged border town of Karkavitta, not a place I really would want to spend the night in, and pretty rough overall. It was like being in the old west. We were passing through its congested streets where they steer by using their car horns. So, horns-a-blaring we reached the border checkpoints for Nepal and India (all three of them), each with their meticulous forms to fill out. I had to laugh. Here I am in the heat of the Karkavitta night, in a one-room office with no screens (malaria! ), trying to fill out a form by candlelight that is more detailed than any U.S. Customs form. And the Indian in front of me is writing these details in an ancient ledger, while high on a shelf above him sits a stack of similar ledgers, all molding away. He takes all the time of ours he can, insisting on every detail. Sometimes I wonder if they just are curious to see and watch westerners. Why else should it take so long? The Nepalese checkpoint was not as bad, but both (two!) of the Indian ones were excruciating. Yet, at long last we were through the border and onto the hot Indian plain and night. Although our driver did not speak English, we both knew that this stretch of road just outside of Karkavitta and into India was the dangerous stretch over which we must pass at whatever speed we could muster, which was hard because of the many speed bumps that caused us to slow down to a crawl or sometimes reach a dead stop. These were the areas where we were vulnerable to attack. And night was falling fast, the worst time to travel, which made these areas even more disturbing. To make things even worse, the road was filled with animals and people, which became dark forms slowly moving in the twilight. But we finally made it through the steamy lowlands and on up into the hills. The road began to climb very sharply and coolness began to replace the hot breath of the Indian plains. Also, the roads were less thronged with people and driving became somewhat easier. We could relax. For hours we climbed higher and higher, now on switchback mountain roads, with an endless stream of packed buses that either we were behind or, if in front and coming toward us, made us back up to let them pass. These are tiny roads, hardly large enough for one vehicle, much less two. We began to be flanked by huge rain forests, hanging ferns, and tea plantations. I breathed a sigh of relief to be going somewhere where the road was not packed with people. And there was the cool mountain air. We had been driving for hours. We did not arrive at the small village of Mirik, high in the mountains, until after 10 PM. It was not hard to find directions to Bokar Ngedhon Chokhor Ling, the monastery of Bokar Rinpoche, and we made the slow climb up an even steeper very narrow road. Our friend Ngodup Burkhar, who (when we had not arrived on time) had worried about us for two days straight, had given up for the night and was already asleep. He appeared bleary eyed, but happy we were OK. In the cold of the mountain night, he found a warm room with Tibetan carpet couches for us and proceeded to prepare a fantastic meal of eggs, rice, too-sweet cookies, and hot water or tea. Food never tasted better. After two days of pure adventure, it was good to be at a safe place with known friends. We were soon bedded down at a local hotel, where we were the only guests. Fairly seedy and creepy, and the faucets didn't work, we got out our sleeping bags and fell fast asleep. We spent the next day with our friend Ngodup at the monastery of Bokar Rinpoche, the meditation head of the entire Karma Kagyu lineage and the chief retreat master there. He is also lineage holder of the Kalachakra tradition, which was derived from the great Jonangpa lineage, the initiation for Tsi-pas -- astrologers. It was there we visited the rare and beautiful Kalachakra stupa, which contains a huge prayer wheel that rings a bell each time it goes around. It is as big as a small cottage. The stupa and the surrounding wall paintings are exquisite, as is pretty much everything about the monastery, a reflection of the fine sensibilities of Bokar Rinpoche. We were lucky enough to receive a long-life empowerment (Amitayus) given by Bokar Rinpoche to some older monks and lay people. We crowded into the small room where it was given. It was very moving. Of all the Rinpoches I have ever met, Bokar Rinpoche may be the closest match to our own teacher, Khenpo Karthar Rinpoche. Being in his presence was comforting. Later, we were able to attend a long Amitabha puja (connected to death and dying) that lasted most of the afternoon. Present were most of the monks and Bokar Rinpoche himself. While I and the monks squirmed and sat through the long ritual, Bokar Rinpoche, high on his raised seat, never moved a muscle. As mentioned, here is a lama that reminds me of my own root lama, Khenpo Karthar Rinpoche. During the puja there were several servings of tea and also tsok, the traditional feast offering. At each break point, a flurry of the youngest monks dashed around serving everyone, filling the cups to the brim with hot Tibetan salt-butter tea. Although my knees ached after a while, there was this sense of peace and beauty. My young son Michael Andrew would come and go, in and out, of the shrine room, sitting with us for short times. The large group of monks, in particular the young elementary school-aged monks, watched little Michael like a hawk. Watching over the little monks and sitting at the rear of the hall in a special seat, the monk in charge of discipline kept a close eye on the youngest monks. This monk was not above moving quickly down the aisle and reprimanding those who were foolish enough to indulge in horseplay, finally evicting one of the worst offenders. Later, he would go down the line of monks, giving some small monies to each of the monks, money that had been donated by patrons to have this particular ritual performed. He also gave a tiny sum to each of the child monks. As mentioned, we also received the Amitayus Empowerment for long life from Bokar Rinpoche while we were there. 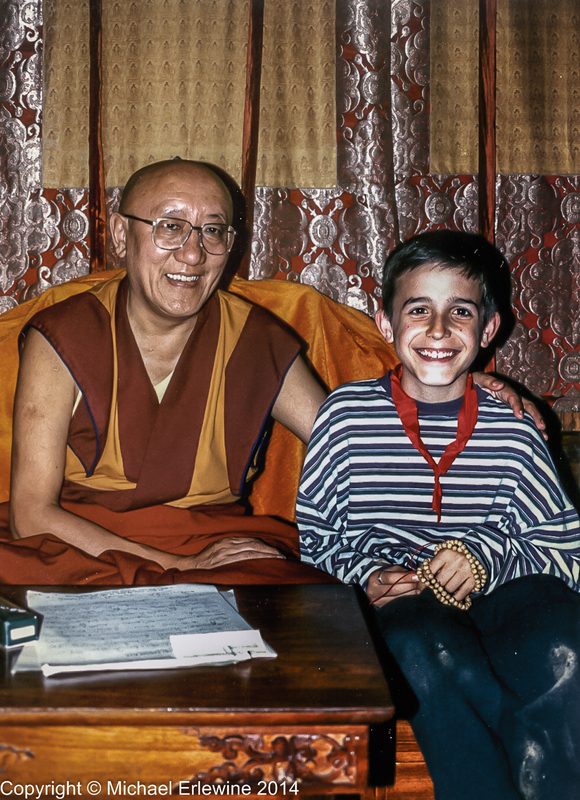 Later, in a personal interview Rinpoche, I was further impressed that here was an exceptional lama. His comments were direct and very much to the point. Basically he told us that we had been to see His Holiness and obtained his blessing and that of many other sacred places, both in Tibet and Nepal. We really had no choice but to turn our minds to the dharma and to practice well from now on. This was the kind of helpful comment we received. I was sad to leave Bokar Rinpoche, and look forward to seeing him whenever that might again be possible. When we left Mirik, about 20 monks, who were about to go into three-year retreat, had just arrived from Pullahari, Jamgon Kongtul Rinpoche’s monastery in Kathmandu. They had been taken out of pre-retreat to come here to receive a series of special empowerments to prepare them for the 3-year retreat, a process that would take two or three weeks to complete. And something very special happened. The first lama out of the small bus was the retreat master, Drupon Khenpo Lodro Namgyal. Everyone had heard of Khenpo Lodro Namgyal. Rumor had it that he had been so transformed in his own retreat that everyone could see his extraordinary results. He became the retreat master himself. I knew Lodro Namgyal because years before he had come and lived at our center just after he had become an Acharya. He was there to learn English. So we knew one another, but what I saw this day was more the transfigured lama I had been hearing about. As mentioned, Khenpo Lodro Namgyal was the first off the bus, and he turned and helped each of his retreatants step off the bus, and this is what I find hard to even think of, much less describe. As each retreatant stepped down, Lodro Namgyal kind of took them into his arms, cradling each of their faces in his hands, like a mother would her child. It was so moving that I had to turn away at first out of pure embarrassment. Perhaps I had been touched this way by my mother when I was too young to remember it, but in society nothing like this ever happens, not ever. It was stunning. I have never forgotten that tenderness that one adult gave to another. It moved me so deeply that I could not even bear to bring it to mind until much later, but at the same time I instantly knew that this kind of pure force is what is missing in our lives, to love one another with true tenderness. It only took a couple of minutes, and they were inside and out of view. When it came time to say goodbye to Bokar Rinpoche, his last words to us were "Tomorrow or next life, whichever comes first!" And we were on to Sikkim.